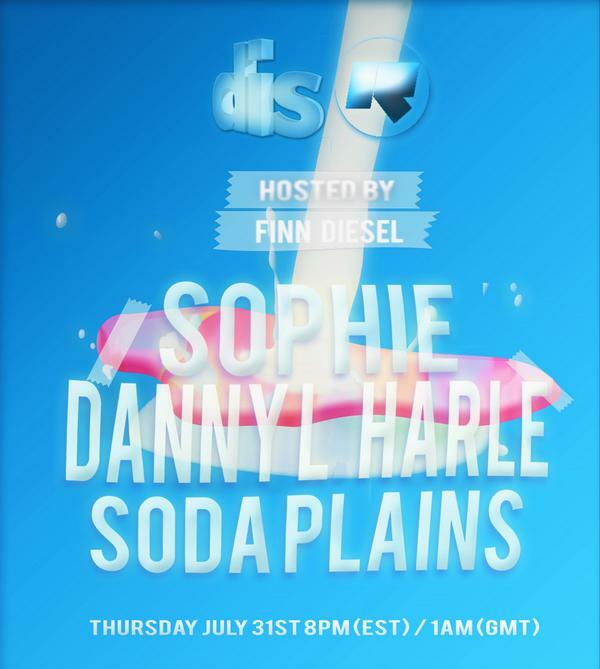 Online art mag Dis Magazine's Rinse FM show, hosted by the site's music editor Finn Diesel, has only been on air a couple of times, but it's already looking like a valuable resource for hearing boundary-pushing new music. Having previously brought in guests like Palmistry, Felicita, and A.G. Cook, the latest edition of the show featured new mixes from SOPHIE, Soda Plains, and Danny L Harle. Soda Plains, a Berlin-dwelling producer, plays music including bits from their 'Firmiana Simplex' mixtape. Danny L Harle – responsible for last year's endlessly listenable Broken Flowers on PC Music – intertwines his own mix with SOPHIE's, broken up into two 10-minute sections, ending with a brill remix of Kero Kero Bonito's Sick Beat. SOPHIE's mix comes with its own ident, delivered in a kind of Valley Girl drawl, and features a lot of the producer's own music. There's room for some of the darker stuff: Hard, the b-side to new single Lemonade, is a song about getting a hard-on over leather, PVC, and fake lips, making a contrast to the sugar sweetness of Lemonade.